A fear of germs or microbes in general: Bacillophobia usually refers to any microorganism which can cause a disease, such as the rod-shaped clostridium bacterium. The bacillophobia can include many types of bacteria, molds, and viruses and can produce an obsessive-compulsive disorder in which a person may almost constantly wash his or her hands. An abnormal fear of being in contact with germs: A person suffering from bacteriaphobia, an irrational dread of microorganisms, usually has compulsions about excessive hand washing and cleanliness. An exaggerated fear of explosive missiles, projectiles, and bullets: Rick, afflicted with ballistophobia, didn't want to join the military because of his terror of holding a gun or, even worse, being killed by weapons. An irrational fear of the force of gravity: Barophobia involves the terror that someone has of the earth's powerful effect of pulling or drawing down, as if he or she were falling, especially when one is overweight. The unreasonable fear of becoming overweight or that one's child will become obese: Because of her baryophobia, Jane was very apprehensive about her daughter Sally getting fat and so she put her on a diet which turned out to be insufficient to support her growth and development, and therefore she went to the doctor to get advice. 1. An avoidance or dread of walking: Sally, having basiphobia after breaking her leg in the accident, was afraid of taking a turn outside because she thought something dreadful would happen as a result, such as collapsing, falling, being injured again, or even dying! 2. An emotional incapability to stand or to walk even when there is no diagnosis of a muscle disease: Even though the doctors said many times over that his legs were completely healed and well again, Jack suffered from basiphobia and was terrified of getting up out of his wheelchair! An exaggerated fear of standing or walking: The basistasiphobia which Mary's grandfather had was related to his fear of falling, collapsing, or causing his death, and therefore he stayed inside his home most of the time! Descriptive of someone who has a dread of going on foot or standing erect: Timothy didn't have any muscular problems after his therapeutic rehabilitation, but he was still frightened of walking by himself or even straightening up on his feet and his doctor described him as being a basophobiac person. 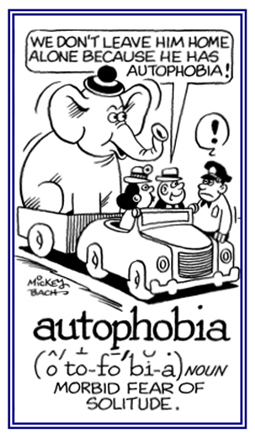 An overly intense fear or hatred of walking: Whenever Patrick went out of his house to go to the local store for food, he experienced a bathmophobia that upset him very much. A bathmophobia may also involve the horror of steep slopes, of going up and down stairs, or of having to be on escalators and elevators. A morbid fear of subways, tunnels, or any kind of similar situation that exists underground: Jim's bathysiderodromophobia caused him to always strive to drive on streets that didn't go below the surface even if it meant that he had to travel farther to his destinations. An abnormal fear of passing or walking close to high objects: Alfred has batophobias whenever he is near towering buildings or tall trees because he has such a dread of heights. The association of Greek batos with “height” is apparently a result of a connection of this word with the second element in acrobat because acrobats are associated with the idea that they perform their arts high over ground levels. A dread or an aversion to toads and newts: Since litte Jenifer was a child, she was afflicted with batrachophobia and abhorred amphibians, like frogs, because they were often wet and slimy! An exaggerated or irrational fear of pins and needles or of anything that has a sharp ending: When Frank was a little child, he grabbed something from his mother's sewing basket and his hand was punctured with pins, and for the rest of life he has had belonephobia which resulted in abnormal behavior and anxieties about such objects. Showing page 7 out of 47 pages of 703 main-word entries or main-word-entry groups.